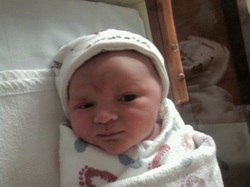 Taylor Robert's Birth 2.25.08 9 lbs. 1.5 oz. Taylor's story starts all the way back in Cambridge, Mass. Bob and I had decided we were ready to start a family. We had gotten to a point where we had removed the goalie and were just waiting to see what might happen, and I was getting impatient. I started looking into charting and started getting a little more serious about reaching our goal. Little did I know that I had a little Taylor growing inside me on the day of Bob's graduation from MIT. As we packed up our apartment and headed back to Blacksburg I was sooo emotional and eating everything in sight, and I didn't have a clue that I had a little one starting to form. Our first week back I got the positive pregnancy test and we began the journey that would change our lives forever. 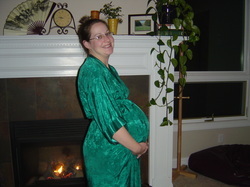 I had high hopes to really enjoy my pregnancy, but the reality was that it was pretty uncomfortable. Taylor was positioned on a nerve that sent shooting pains through a pretty sensitive area, so I often found myself writhing in pain. This also had me experiencing sciattica at night, which resulted in my having to switch sides every hour in the night, hence I got pretty poor sleep. It was always a joy to feel him moving around inside me, and he gave me plenty of opportunities! This was a child that was in constant motion, day and night. Fast forward to a snowy Sunday evening in February. That Friday I had sent the last of my dissertation's body chapters to my committee and that particular day I completed the first two scrapbook pages for Taylor's scrapbook. I had some sonogram pictures and a little letter to him sharing my excitement about his impending arrival. As I bent over to put his scrapbook down, I felt a surge of discharge come out of me. Now, as a pregnant woman, this was not an entirely new experience, but it seemed a little different than past occurrences. The next few hours were spent with me going back and forth to the bathroom, asking Bob to look in the toilet and trying to analyze all that we saw there. We called our OBGYN and told him about the discharge. I had been having Braxton Hicks contractions for the last few weeks, so I started to monitor those to see if they were coming closer or stronger. We had a little post-it note where we were keeping track of the contractions and discharge, and Bob had the contraction timer app he wrote for his phone. I took a shower, shaved my legs (as best I could) and did my hair. Eventually, around 10 p.m. we decided it might be the real deal and off we headed to the hospital. I remember that the Grateful Dead's "Box of Rain" was playing on the radio, and it was snowing outside. We got to the hospital and they took us into triage. By this time, I had a pad and felt like stuff was coming out of me every time I moved. Looking back, it's hard to believe I still wasn't sure if I was going into labor. The nurse confirmed that my water had indeed broken. It turns out that the way Taylor was positioned, he was blocking the way so that the water only came out when I (and he) moved enough for it to leak past the blockage. This is why it didn't all come out as one big gush. They situated me in my room and asked if I wanted to go ahead and get the epidural. It had certainly always been in my plan to have the epidural. I hesitated about getting it so early and then the nurse said, "I've never heard of a woman complaining about getting it too early." So I went ahead and had the epidural. It did hurt to have the injection, but it was pretty much like just a hard pinch. After that, I spent about 10 hours in the middle stages of labor, having contractions pretty regularly, getting monitored, trying to rest and conserve energy. They wanted to give me Pitocin to speed things along, but I didn't see any reason to do the extra drug when everything was proceeding at a normal pace, so I declined. I think it was a good choice to decline the Pitocin, but I will say that it was a long labor; about 22 hours from the time my water broke. I spent a good amount of the time throwing up. They had a very handy, portable barf bag, which was nice, but the reality was that while I wasn't in a lot of actual pain, but I was pretty uncomfortable. Bob spent a lot of time getting cold washcloths and mopping my brow. I had a period of time where I just slept really hard, too. It was like my body knew we were getting ready to do something big that would require all of my strength. 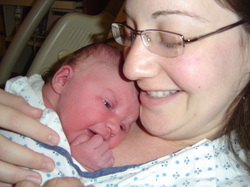 At about 12:00 p.m. on the 25th the contractions were coming strong enough that they decided it was time. I had a very cool, almost tribal song from Vienna Teng playing for most of this time (Soon, love, soon...the fate of one is the fate of all...) and the doc explained to me that as I heard the big contractions on the monitor I would push for 10 seconds and then we would break and breathe for 3 seconds. Bob held my hand and counted with me. We got to a point where the epidural was starting to wear off, and at that point I could really feel my contractions coming stronger. We actually unhooked me from the monitors and I just went with the natural rhythm of my body. After a few more pushes, Taylor was out! They tried to put him on my chest, but his chord was really short, and they could only place him on my stomach. It was all sort of surreal, actually. I couldn't believe that we had actually done it and delivered the baby, but of course there he was, living proof. I sort of felt removed from everything. Bob held a swaddled Taylor while the doctor stitched me up, and that was actually probably the most painful part for me. By that point, the epidural had almost completely worn off, and I could really feel a lot of the stitching. Perhaps because Taylor was so big (over 9 lbs. ), maybe there was a lot to stitch up. I know I tore in multiple places. There was one very special moment. As I lay there, I started to sing a lullabye to Taylor, one that I sang him when he was in the womb. As I was singing, I heard the doctor, "sniff, sniff." Eventually, I got a little overcome with emotion and had to stop singing. It was then that the doctor started singing and finished the lullabye. It was really very special! We stayed in the hospital for two nights after Taylor was born. The first night he slept very solidly. The second night, not so much. I don't think the birth story ends with the birth of the baby, though. There is so much that happens afterwards.